He joined the Capuchin Franciscan monks and became a priest in the early 1900's. He received the stigmata in his hands feet and side after seeing a vision of Jesus after Mass. Padre Pio said Mass at 5 AM daily and spent the rest of the day hearing confessions and blessing the sick. He had the gift of discernment and often had insight in the confessional that was regarded as supernatural. His popularity grew to the point that busloads of people came to his Masses and confessional and items of his clothing were often torn off him as happened to St. Frances of Assisi. The Church curtailed his public ministry for almost ten years until they were convinced of the authenticity of his stigmata. In 1962 An archbishop, Karol Wojtyla, from Poland wrote him a letter asking him to pray for a friend's wife who had throat cancer. Two weeks later she was healed. In 2002, Pope John Paul 2 through the authority of the Catholic Church canonized Padre Pio. I live about 17 miles from one of the largest shrines to Padre Pio in the US. It is nestled in the rolling hills of eastern Pennsylvania. It is a beautiful place to pray, worship and thank Jesus for the work he has done in His body, the Church, through the life of this Saint. 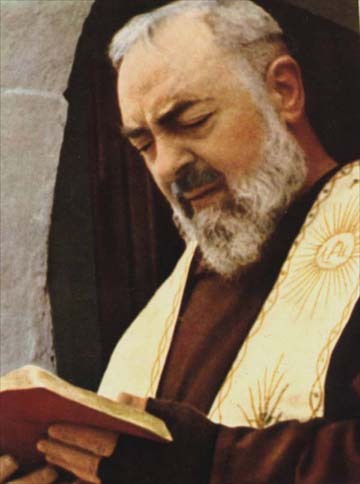 When I go there, I ask Padre Pio to pray for me for some of my gravest concerns knowing that the "effectual fervent prayer of a righteous man availeth much." You may argue and say that folks in heaven can't hear you but follow this logic: If the angels in heaven rejoice over one sinner that repents, clearly the lines of communication are open between heaven and earth. Since Scripture teaches that we will judge angels, I don't think it's a stretch to believe that those in heaven can hear the prayers of those on earth. The Church has always taught this and the writings of the Fathers bear this out. Just to make one point clear though: I don't worship him or prostrate myself before his statue or picture. I don't say "Oh praise you Padre Pio" for that would be breaking one of the first commandments! Instead, I honor this fellow christian who radically followed the call of Christ in his life and was obedient. He followed Jesus on His terms, not his own. I know that my devotion to Padre Pio will only increase my love for Jesus more and more. That's the whole purpose of the Communion of Saints and I am thankful for such a great cloud of witnesses that have gone before me. What did I do before I had you guys? Oh, that's right, you were praying for me, I just didn't believe it! St. Padre Pio, continue to pray for us so our hearts will burn with the love of Christ .